NuRAN Wireless Inc. (“NuRAN Wireless” or the “Company”) (CSE:NUR)(CSE:NUR.CN)(CNSX:NUR)(OTC PINK:NRRWF) is proud to announce it has been selected to supply a newly developed software-defined radio (“SDR”) to NASA’s Glenn Research Center. This new SDR is designed specifically for research on multi-element arrays and overcomes one of the major technological barriers with SDR so far by supporting a very high number of antennas while maintaining phase coherency between them; a real breakthrough. As a result of the company’s commitment to innovation, NuRAN Wireless is proudly joining General Dynamics, Jet Propulsion Laboratory, and Harris Corporation as a supplier of software defined radios to NASA. NASA Glenn Research Center is one of ten major NASA field centers. Recently, the Center has been working with software-defined radio (SDR) developing technology for use in aeronautics and space. One of NASA’s notable endeavors is the SCAN Testbed, a SDR-based reconfigurable on-orbit Communications, Navigation, and Networking system. At the core of the SCAN Testbed are software-defined radios (SDRs). “Being selected by NASA is further validation of the quality of talent and work that we have developed at NuRAN Wireless and Nutaq Innovations, our wholly owned engineering subsidiary. 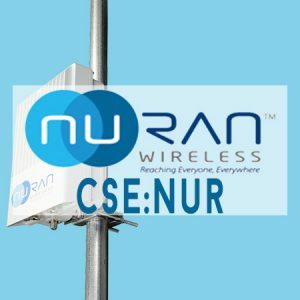 We continue to push the envelope by partnering with top tier companies around the world while maintaining our core focus on democratising access to mobile connectivity for the unconnected,” states Martin Bedard, Co-CEO at NuRAN Wireless Inc.
Software-Defined Radio is used to describe a radio transmitting/receiving hardware that is reconfigurable. Software-defined radio have significant utility for military and mobile (cell phone) applications, both of which must serve a wide variety of evolving radio protocols in real time. NuRAN is also pleased to provide a Corporate Update. 2017 has been a very busy year so far for the Company as it continues to increase its sales backlog while working on the leading edge of the next phase of its development including a collaboration on a 4G LTE BaseStation with partners such as Cavium, Facebook, Keysight and a 5G BaseStation with Viettel. Its current backlog is now over $7M with many more contracts expected to be announced over the next several months. Also important, NuRAN’s backlog now includes deployments for a number of Tier One Operators. Feb 21: NuRAN receives an over $1M order of its LiteCell 1.5 to be deployed for a Tier One Operator, by Africa Mobile Network (“AMN”), in Africa.